I need faster way to promote a node I'm looking at. Is there a faster way than that? The idea is to have a "Make this sticky" tab or link. Sure, you can simply add any field to your node type and use that. Let it be a simple checkbox for example. Hide that field from node display. It should just be displayed on the form display. Put it in a prominent position. Finally, via hook_form_alter add another submit handler that then checks the input of that checkbox and sets the node's sticky value accordingly. I just released Toggle Sticky Toggler. Which adds a "Make Sticky / Unmake Sticky" tab next to the default "Edit" tab. How to unpublished a node from a view? How to upload multiple images as multiple nodes? 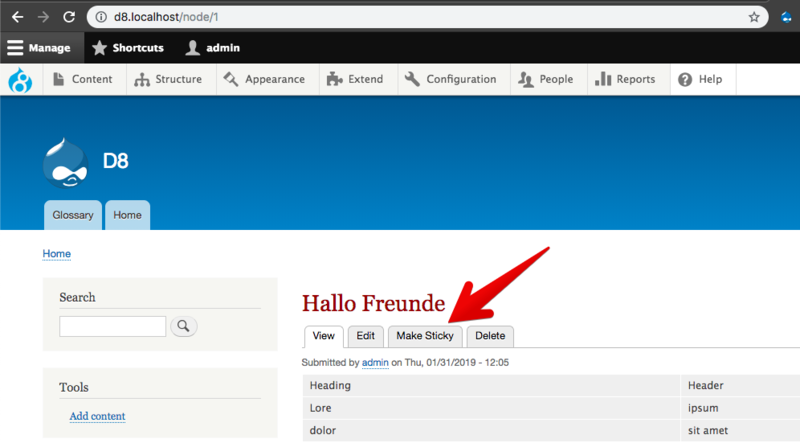 How to get the publishing and menu fields from the node edit form in the “Manage fields” tab? How to manage Sticky Content? How can I display the field in the tab that was active on save?